This game is possibly one of the best RPG’s I’ve ever played, and its appeal has stuck with me through multiple playthroughs over the years. If you have access to a SNES you should definitely add Secret of Mana to your collection. If you’re lucky enough to get a boxed copy (it can be pricey) be sure to get the glossy world map that accompanies it. Although its just a novelty, physical maps are hard to come by for games these days, and it is a nice touch. If you don’t have a SNES, you can pick this gem up on the wii shop channel for a reasonable and price. 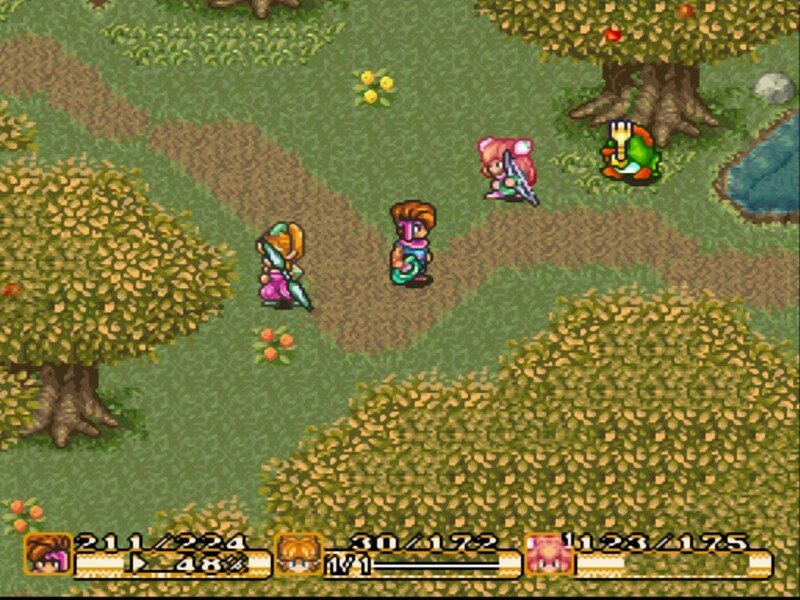 Secret of Mana is one of Squaresoft’s early RPG’s and is part of a trilogy known as Seiken Densetsu in Japan, (roughly translated as Legend of the Holy Sword). Secret of Mana is the second in the series, which isn’t directly linked, the first being Mystic Quest: Final Fantasy. Mystic Quest in itself was kind of a ‘diet’ Final Fantasy more suited to western players, and you can see that influence in Secret of Mana, which plays kind of like a happy medium between the action/adventure of the top down Zelda games, with a light weight ring menu system, more like a traditional RPG, along with a balanced story. There are also spin-offs which haven’t been great. Upon starting the game, were given some back story to the history of the world. Ominous and eerie music, with almost a heartbeat shows darkened images of ruins and destroyed forests. We are told of a world where the power of Mana was used to advance a civilization. They created a giant floating techno-fortress (the Mana fortress) to rule the world. But this of course angered the gods, who sent Mana beasts to destroy the world. 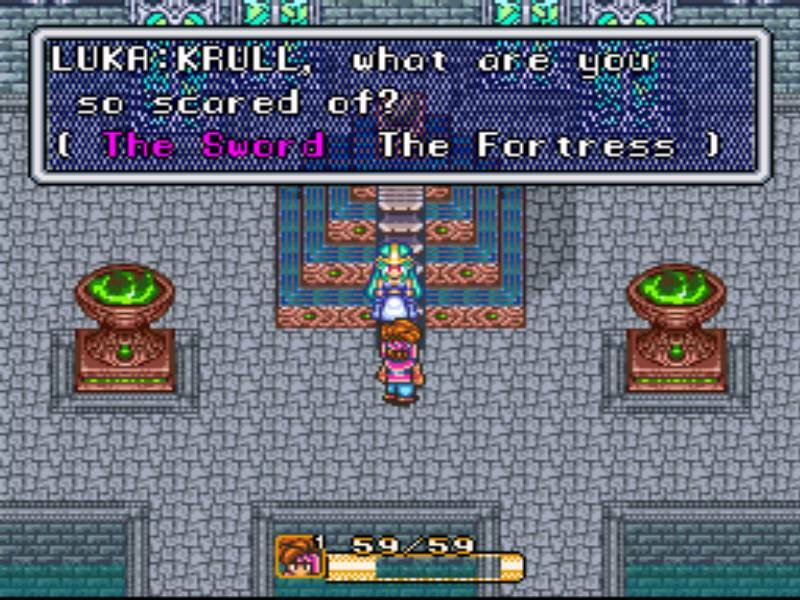 Luckily, a hero wielding the Sword of Mana destroyed the fortress and saved the world. You play an orphan living in the village of Potos. One day you go to the local waterfalls, which is a forbidden area, and being the of course you fall off a branch and down the waterfall. You need to cut through some grass so you find a rusty sword in a stone. Very convenient indeed. You easily pluck it out, and are greeted by a ghost. Hes only there for a brief moment. *SPOILER* Long story short, he eventually turns out to be your dad, and your mothers been turned into a giant tree (no seriously). It kind of makes sense when its revealed as to why, but it would probably help to apply a bit of anime logic to your reasoning. Subsequently you are kicked out of your village, because a monster attacked, you killed it, saving your friend who only moments before had been beating the crap out of you. You see, the villagers are pissed you took the sword because they think it keeps their village safe. A stranger in a bar asks you to join him in the ‘water palace’. Sure why not? Whats the harm in that? He’s only a soldier in the Republic, who is at war with the evil Empire, who are trying to revive the fortress from the legend, and all he wants to do is to get you entangled in the whole mess, tasking you with travelling all over the world trying to seal the elemental ‘seeds’ that will stop the Empire. No harm at all, what else were you going to do, sit outside Potos eating ‘Rabbites’. (one of the many humorously fluffy and cute enemies that will try to tear you apart). As you progress, you get teamed up with a girl and a Sprite. They join you for different reasons, and you kind of end up tangled in their crap too. The girl in particular is trying to get her boyfriend back from a witch, who is taking orders from a nutty cult leader called Thanatos, who seems to be working with the Empire. *SPOILER* He’s an ancient Lich, who steals people’s souls and has his own designs on the world. The girl’s boyfriend is called Dyluck (and I can’t for the life of me not read it as Psyduck now) who just happens to be very special and can accommodate the Lich’s soul, but this isn’t really established at all as to why, its really just a footnote at the end of the game. You meet the main cast’s various parents and relatives, as NPC’s in towns and villages, but their dialog never seems to change, and they don’t seem too concerned when something goes wrong or one of their loved ones is abducted. It is a little odd to say the least. Not all characters are human in the game, as you may have guessed. The Moogles from Final Fantasy, make an appearance, and in fact are also a bad status you can be inflicted with. They look a little bit like bars of soap with ‘Krusty the Clown’ hairdos (I think its supposed to be their wings, but the pixels really do make them look weird). There are also Dwarves, Sprites, Cat-people (of course, anime logic), and for most of the game you will be beating up killer mushrooms, until you find some mushrooms you like, that can speak, that are friendly, that have the same legends as you do, that… can grow a white dragon so you can fly on it? Wait, what? (actually it does fit in with the story, but it is ridiculous when you think about it). 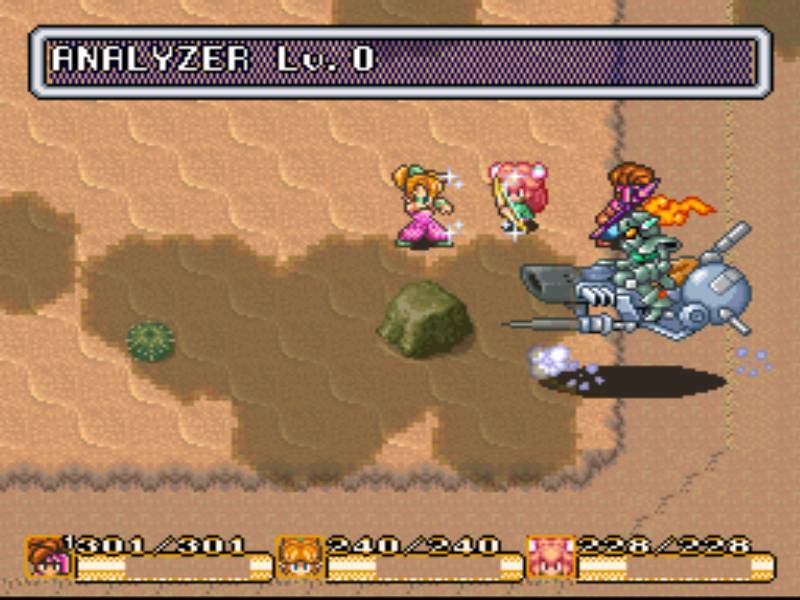 The combat system in Secret of Mana is fun and simple. You walk around the world, and attack enemies with one of eight ‘Mana Weapons’ that work in different ways and have different stats. You fight them they way you would attack in an adventure game, press the button to swing the weapon near the enemy and attack. after a swing, you are fatigued for a few seconds, but you can build up a charge meter by holding the button, creating a big attack. You can charge to same level as the weapon and your skill with the weapon (which increases with use). 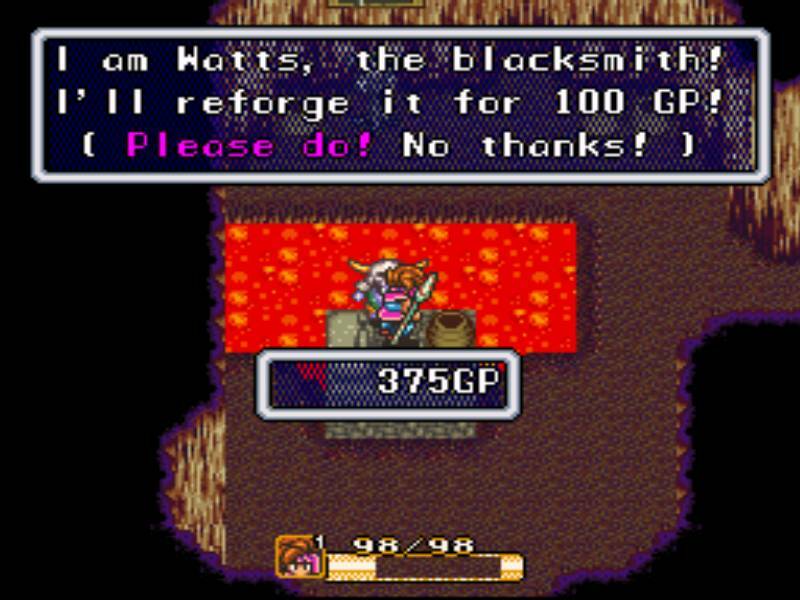 Weapons are upgraded by spending ‘Orbs’ obtained from monsters and chests, along with money, at a blacksmith who has a magic hammer and looks like he belongs in an elephant graveyard. Himself and a Cat vendor appear at many locations offering their services, such as saving the game. The Cat’s dialog can be really annoying, its full of ‘meows’ and ‘nyaas’. Come to think of it, there’s a lot of deliberate misspelling in the dialog, probably in an attempt to create an accent, example, be prepared to see the word ‘haaalp’ a lot. At the early stages in this game, the combat can actually be a little bit unfair. Almost every treasure chest you open for the first hour will contain poison needles or a bomb, and some monsters can conceal themselves, like flowers that appear to be part of the background. It gets easier as the game goes on, when you get magic. At first though, status effects like poison can be fatal, as you wont have much hp, you won’t have a big inventory and you won’t have cure magic. This can leave you open to a one hit kill, resulting in a premature game over screen, possibly setting you back a frustrating few hours if you have not saved in a while. It’s particularly annoying at the early stages of the game, that certain bosses like the ‘Spikey Tiger’ and normal enemies, like werewolves, can stun lock you to death. That’s right, your character can be made unconscious, repeatedly, as he or she tries to get up, and all you can do is watch (It’s easier to avoid later in the game, with use of magic and the ‘action grid’). The ‘action grid’ is kind of useful really. I would consider it to be a very basic version of the ‘gambit’ system in Final Fantasy 12. Basically you can control one of the three characters, with the other two being controlled by an AI. Each character can be placed on a grid, deciding if they will approach an enemy, stay back or provide support. Alternatively a second player can control one of the remaining characters, but this becomes more awkward than two-player Final Fantasy 9. Switching between characters on the fly, is easy to do, and a good way to avoid the stun locks. 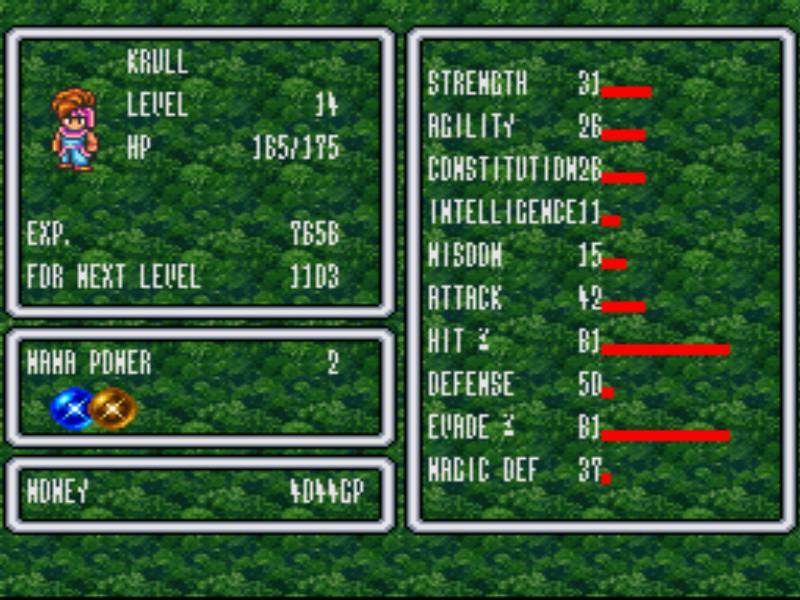 You can access their spells and actions through ring based menus at any point during the game, which kind of works like a pause menu, giving you a few moments to think if you’re fighting a boss. The girl and Sprite both get magic from funny little characters, the Elementals, during the course of the story. The main character gets fobbed off when he asks for magic, being told his sword will one day become more powerful than any magic. It doesn’t, and the characters who get the magic can also use the sword anyway. Purely in terms of power and versatility, the Spear ends up being the strongest weapon. 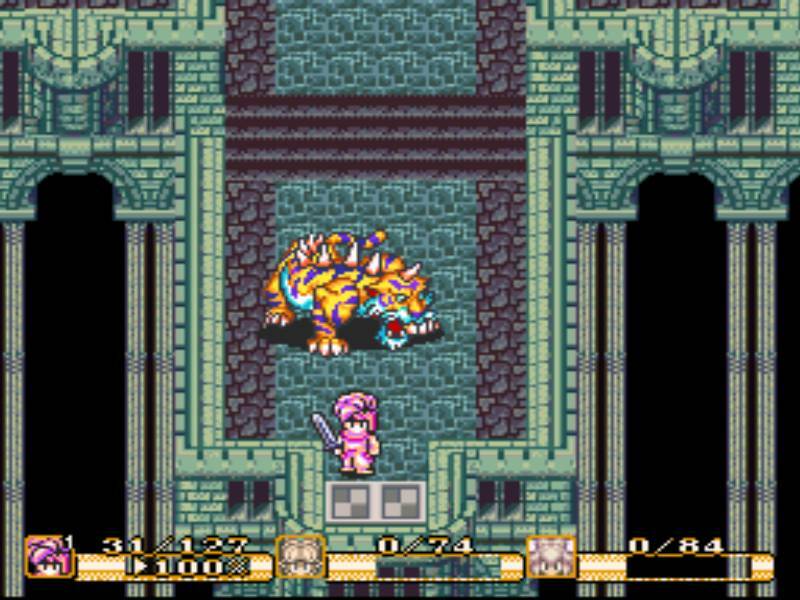 For story reasons, a buff from magic makes the sword powerful enough to damage the last boss, but it’s pretty lame. Your characters are given a lot of stats, that aren’t fully explained, you can view them from the ring menu, but don’t really need to know about them to play this. All that really matters is your level, hp, mp and armor. Things like ‘constitution’ that seem to stay the same for the whole game don’t seem to have much bearing on gameplay. While some enemies are deadly serious, like the Empire’s men or Thanatos, there are a lot of comic relief enemies too. These include the ‘Scorpion Army’ which are kind of like the Three Stooges, mixed with the mafia. They love to show up and attack you with their messed up 80’s robot, that is a big culprit of the stun lock strategy. Also, one of my favorite parts of the game pits you*Spoilers**Spoilers**Spoilers* against a Frost Gigas, who has kidnapped a Reindeers’ master. The Gigas turns out to be none other than Santa Claus, who stole a Mana Seed to grow a giant Christmas tree in order to make children believe in him again or something. The seed turned him into a monster and that was that, I guess. For a fantasy world, there’s also a lot of technology floating around. You will have to fight one of the Emperors generals a few times, and he happens to be on a flying motorbike, for… reasons? One of the Emperor’s Generals reveals he’s actually part of an organisation known as the Underworld, and turns into a giant magic ball thing. This is never elaborated on, or explained. The music in Santa’s ice palace is ethereal as can be, its definitely got a beat to it. The music is a major positive to this game. It fits the mood, and sets in well with the scenes. You can really appreciate the moments of tension or comic relief, from the soundtrack. If you’re the kind of gamer that listens to things like the Black Mages, then the soundtrack of this game is for you. Add it to your playlist of geekishly dorky, yet delightful music, today. The graphics in Secret of Mana are colourful and easy on the eyes. 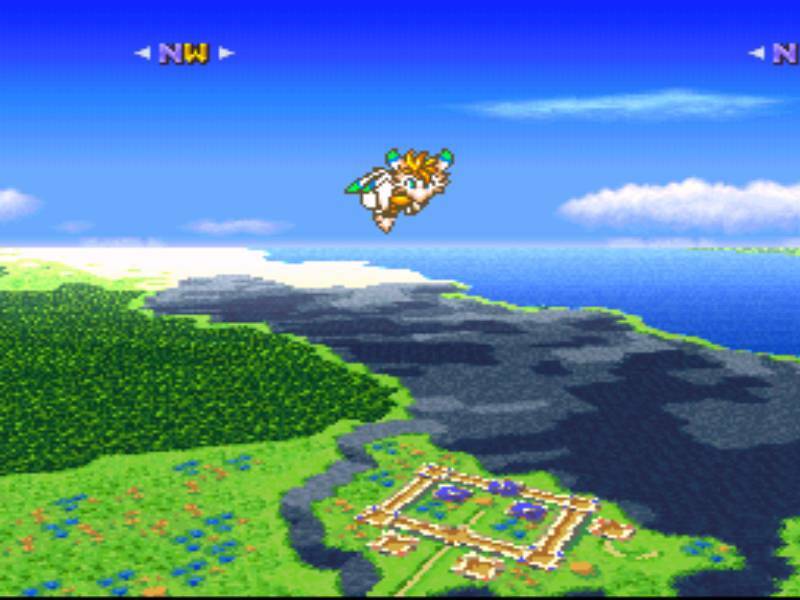 Given that it’s and old SNES game, Secret of Mana really does look good. Little 2D anime sprites running around different countries and terrain beautifully rendered. From lush green forests to frozen wastelands covered in glistening crystals, it’s just a nice retro treat to view. When you travel on the world map, it gets a little different. You’re put into an awkward mode 7 textured map. You will first notice this when you are using fast travel, which involves a caveman shooting you out of a cannon, and depicting your characters barrel rolling to their destination (but not snapping their necks when they land). You get a better look when you fly on your dragon later in the game, which kind of serves as your ‘airship’. I found a pixelated face in the middle of the sea when i played the game, I always wonder if it was done on purpose. When a monster dies, or you gain a new power, or use certain magic, the screen can literally explode with flashes of light. Its a good effect, but can look a little too severe on a modern screen. Also originally players were urged not to press any buttons during these sequences as it apparently caused the game to crash. 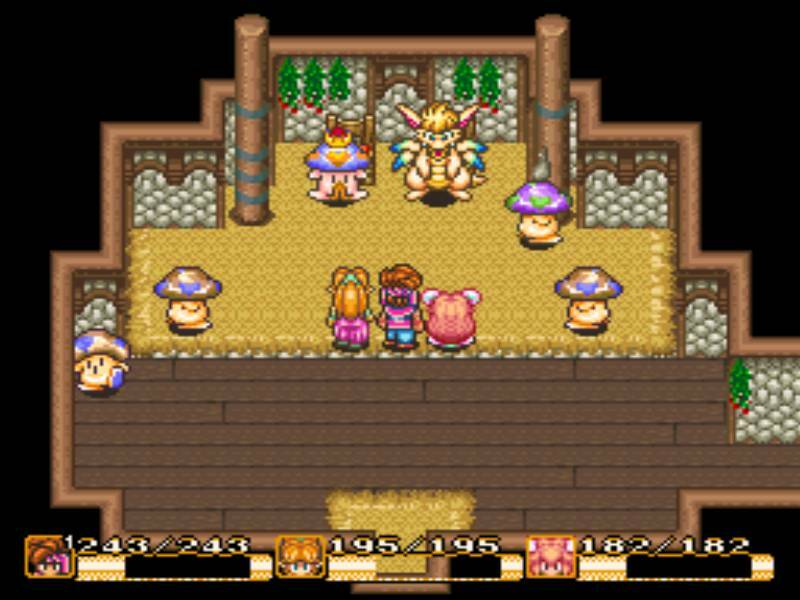 There are probably a million other things to say about Secret of Mana, it would take weeks to compile a review that fully does this game justice. All in all its a nice game, a happy medium between Zelda and Final Fantasy, you could probably breeze through it on a weekend, there isn’t too much grinding for levels to be done after the first hour of the game, you can kind of just level naturally as you play. The story is enough to keep you interested, and I assure you, I have not spoiled enough to give you the full scope of this tale. If you like this game, you should also check out Secret of Evermore, Illusion of Time, Chrono Trigger and of course, Legend of Zelda: A Link to the Past. That’s all for now….